The next cluster meeting will take place on 9 Oct 2015 at IMK-IFU in Garmisch-Partenkirchen. The use of unmanned aerial systems (UAS) is now widespread in climate and environmental research. The cluster facilitates UAS-based research at KIT through funding of PhD theses and exchange of instruments and ideas. The cluster has been set up in 2014 and is currently populated by PhD students from the KIT institutes of Geography and Geoecology (IfGG), Meteorology (IMK-IFU) and Water and River Basin Management (IWG). Apart from stimulating and promoting the work and collaboration of PhD students, the cluster should also be seed of crystallization for research collaborations in the field of Unmanned Aerial Systems (UAS) at KIT in general. Current research includes the following topics. Greenhouse gas emissions (e.g. methane), in-situ parameters to describe turbulent fluxes, radiation parameters for the energy balance as well as characteristics of the earth’s surface like temperature, soil moisture and albedo (IMK-IFU: Caroline Brosy). Rapid processes in vegetation from leaf to canopy scales are investigarted using a hyperspectral sensor. 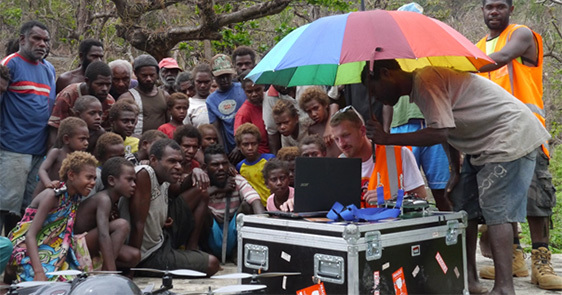 This allows for spatial assessments of ecosystem processes including disaster mapping (image above: Vanuatu 2015) and long-term ecological monitoring (IfGG: Javier Lopatin, Teja Kattenborn, Johannes Schmidt). Erosion and sediment redistribution in agro-ecosystems are an additional focus. The characterization of such dynamics will be used to parameterize process based erosion models (IWG: Conrad Jackisch, Petra Gabelmann). Applications for funding are still being considered. Prerequisite for funding is an additional PhD position financed by the respective hosting KIT institute (please contact the GRACE office or the cluster for further information).